Awards programs currently available to recognize Lawrence Technological University faculty, administration, and staff include the Department of Excellence Award, Employee of the Month, Marburger Awards and the Service Recognition Awards. This program will be effective each academic year from September through June. Lawrence Technological University recognizes a department who has made a significant contribution to the University during one of the following previous three (3) month quarters (e.g. January-March; April – June; and September – December). All departments that have a unique budget are eligible for this award. The department receives a Note of Congratulations from the president about its recent accomplishments and what it means to the members of the unit and the University. The president and top executive of the division have a recognition gathering to share the Note of Congratulations and acknowledges everyone. Photos are taken by Marketing and Public Affairs. 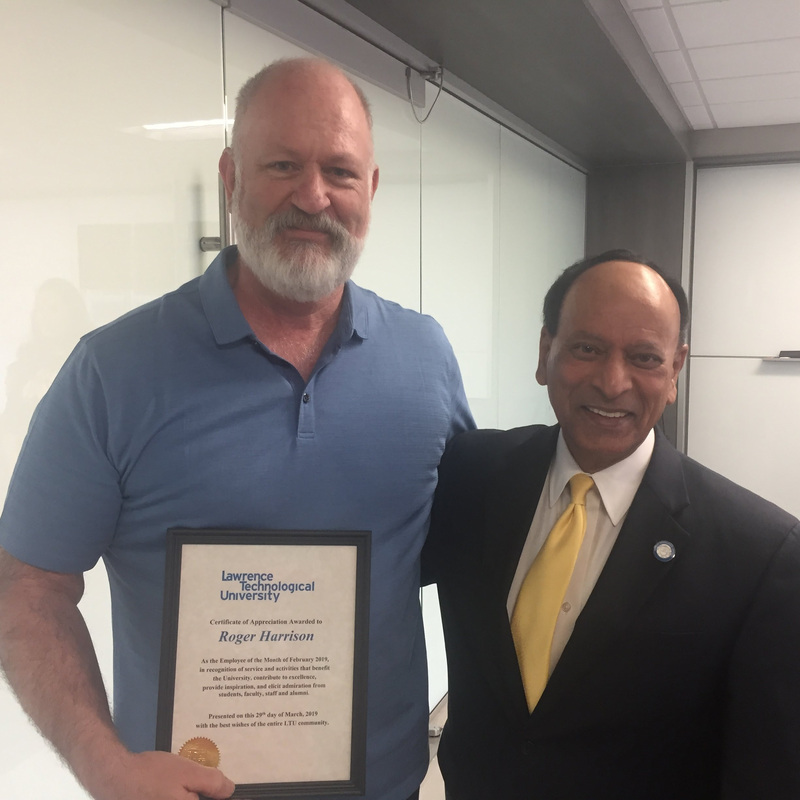 Lawrence Technological University (LTU) recognizes an employee who has made a significant contribution to the department during the previous month. Eligible employees include all full-time and part-time staff, and administrators excluding vice presidents, provost and deans. Campus Dining and Campus Facilities employees may be considered for this award. Awardee receive a gift that relates to the honoree’s hobby presented to the employee with an Employee of the Month certificate; the president visits selected employees in their work setting to present them with an Employee of the Month certificate and thank each honoree personally for a job well done. Photos to be taken by Marketing and Public Affairs and campus facilities dedicates a parking space closest to the building entrance to the selected employee. Lawrence Technological University (LTU) recognizes employees for their years of service every five years beginning at five years of service. Each awardee receives a specially designed LTU service award lapel pin. Employees with 15 or more years of service may choose from a variety of awards from a special order catalog. All awardees are honored annually at a luncheon ceremony held in September. President Emeritus Richard Marburger, PhD, and his wife Mary founded this awards program. The Marburger Awards program is designed to recognize faculty, administration, and staff who contributed the most outstanding and meritorious service that year. Recipients receive a certificate and $1,000. Awardees of this program are elected by their peers and honored annually at a luncheon ceremony in December. Campus-wide email from the president’s office congratulating the winners and nominees. Photo plaque displayed on the Wall of Appreciation. Awards programs currently available to recognize Lawrence Technological University faculty, administration, and staff include the Service Recognition Awards and the Marburger Awards.